Common display interfaces, to scale. 720 × 480i @ 59.94 Consumer electronics, including VCR and LaserDisc, 1970-1980s home computers like the Commodore VIC-20, 1980s-1990s video game consoles, some laptops, some single-board computers like the Raspberry Pi Used with PAL, NTSC or SECAM color. 720 × 480i @ 59.94 Consumer electronics, Commodore Amiga and various video games European "unified" A/V interface for bi-directional stereo audio, composite video and s-video, and unidirectional RGBS and data. Composite and s-video can use PAL, NTSC or SECAM color encoding. YPBPR is also available in some non-standard set-ups via the RGB pins. 720 × 480i @ 59.94 S-VHS, some laptop computers, analog broadcast video, 1980-1990s home computers including the Commodore 64, C128 and Atari 8-bit The 4-pin mini-DIN that is most common in consumer products today debuted in JVC's 1987 S-VHS. The 7-pin mini-DIN is commonly used on laptops. Used with PAL, NTSC or SECAM color. Where two connectors are used, they are labeled Chroma and Luma. VGA 1987 VGA connector variants include DE-15/HD-15 (canonical), DE-9, RGB or RGBHV on separate BNC connectors, Mini-VGA, DVI/Mini-DVI/Micro-DVI. Analog 2048 × 1536 @ 85 Introduced with IBM x86 machines, but became a universal analog display interface. Display Data Channel was later added to allow monitors to identify themselves to graphic cards, and graphic cards to modify monitor settings. Successor analog protocols include SVGA, XGA, etc. DVI is a more modern digital alternative. Where BNC is used, available as 3 connectors with Sync on Green, or 5 connector Red / Green / Blue / Horizontal Sync / Vertical sync. Mac-II/Quadra 1987 DA15F Analog 1152 × 870 @ 75 Macintosh Mac-DA15F and Sun-13W3 were similar in capability to VGA. Some Sun machines used 4 or 5 BNC connectors to transfer video signal. 13W3 1990 DB13W3 Analog 1152 × 900 @ 76 Workstations. Sun, SGI et al. Apple-AAUI (D-Terminal) D-Terminal uses voltage levels to signal resolution. Digital Visual Interface (DVI) 1999 DVI, Mini-DVI, Micro-DVI Both 2560 × 1600 @ 60 3840 × 2400 @ 33 Recent video cards Almost a ubiquitous computer display link. Uncompressed video only. High-bandwidth Digital Content Protection (HDCP) encryption is optional. Serial digital interface (SDI) 2003 BNC Digital From 143 Mbit/s to 12 Gbit/s, depending on variant. 480i, 576i, 480p, 576p, 720p, 1080i, 1080p, UHDTV1, . Broadcast video. Variants include SD-SDI, HD-SDI, Dual Link HD-SDI, 3G-SDI, 6G-SDI, 12G-SDI. Many A/V systems and video cards (including motherboards with IGP) High-bandwidth Digital Content Protection (HDCP) encryption is mandatory. ATI RV670 based graphics cards and NVIDIA G92 graphics cards (both as OEM optional implementations) DisplayPort introduced the 128-bit AES to replace HDCP. DisplayPort version 1.1 added support for HDCP. 4096 × 2160 @ 24 A/V systems High-bandwidth Digital Content Protection (HDCP). RF connectors (radio frequency signals). Generally use coaxial cable types such as RG-6 and RG-59 (except for twin-lead). Belling-Lee/IEC 169-2 connector TV aerial plug (a.k.a. antenna plug) Television antenna connection for most video devices outside North America. Used by early home computers and game consoles to connect them to TVs because of the lack of any other connector. Generally not used in North America. BNC (Bayonet Neill-Concelman) Alternative to RCA for professional video electronics. Serial digital interface (SDI) and HD-SDI. 75 Ω for video signal (SDI and CoaXPress) on, for example, RG59 and RG6. 50 Ω for data link, like Ethernet on RG58. F connector Used for most North American TV antenna connections, as well as satellite and cable systems worldwide. Also common in North America for early home computers and game consoles, older VCRs, RF modulators, and even CECBs due to lack of other connectors. Once not used outside North America for TV antennas (except for satellite reception), but gaining acceptance elsewhere with advent of digital TV. N connector (Neill connector) Mostly seen on professional quality VHF and UHF cables and equipment. Generally 50 Ω but has been manufactured as 75 Ω; difference being thinner centre connectors; not reliably interconnected. 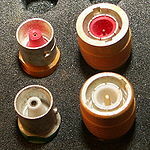 Twin-lead Used for older TV antenna installations in the US and various other countries worldwide. Current use generally limited to baluns to adapt 300 Ω twin-lead to/from 75 Ω F connector. Replaced by F connector in North America and Belling-Lee Connector in other countries outside North America. DE-15 male plug. VGA connector (DE-15 is a common variant.) Became a nearly ubiquitous analog computer display connector after first being introduced with IBM x86 machines. Older VGA connectors were DE-9 (9-pin). The modern DE-15 connector can carry Display Data Channel to allow the monitor to communicate with the graphics card, and optionally vice versa. Being replaced by DVI from 1999 onward. DB13W3 Analog computer video, color and monochrome. Sun Microsystems, Silicon Graphics, IBM RISC, Intergraph and some Apple Computer computer workstations. Obsolete; replaced by VGA and DVI. Same connector was used by 3Com for a redundant PSU on the 3300 switch family. Digital Visual Interface (DVI). Five variants are: DVI-I single link, DVI-I dual link, DVI-D single link, DVI-D dual link, and DVI-A. Almost ubiquitous for modern computer video cards. Male Mini-DVI plug on top of a 12-inch PowerBook G4; female port is second from left. Mini-DVI VGA, DVI, television. Apple Computer alternative to Mini-VGA. Often now replaced by Mini DisplayPort. Female Micro-DVI port (rightmost) on MacBook Air Micro-DVI DVI-D dual link Replaced with Mini DisplayPort. Apple Display Connector Combines DVI, USB, and power. HDMI connector plugs (male): Type D (Micro), Type C (Mini), and Type A. High-Definition Multimedia Interface (HDMI) High definition digital video devices (HDMI protocol) Electrically compatible with DVI-D and DVI-I, but not DVI-A, using a simple adapter. Three RCA connectors - yellow for composite video, and white and red for stereo audio RCA connector Widely used in consumer electronics for audio and video. A single connector must be used for each signal. SCART Consumer electronics, mostly in Europe. Carries stereophonic sound (analog), along with composite video and/or RGB video. Some devices also support S-Video, which shares the same pins as composite video and RGB. YPBPR is also sometimes supported as a non-standard extension via the RGB pins. D4 video connector D-Terminal Popular in Japan for analog high definition video. Available sizes are D1 through D5. Male Mini-VGA plug on top of an Apple laptop, female port is second from right. Mini-VGA (used for laptops) Used for laptops, especially from Apple Computer and some from Sony. AV Multi (gold-plated male plugs) AV Multi Sony proprietary. Combines composite video, S-Video, RGsB/YPBPR (both use same pins) and stereophonic sound (two analog channels). Used for all analog audio and video out on the PlayStation line of home video game consoles (a few early original PlayStation models featured RCA-outs for composite video and stereo analog audio in addition to the AV Multi connector); not used on handheld PlayStation consoles or the PlayStation 4. 35-pin MicroCross Molex connector VESA Enhanced Video Connector and VESA Plug and Display (a.k.a. M1-DA) both used this connector with slightly different pin assignments. These schemes combined VGA or digital video, audio, FireWire, and USB signals into a single connector. Deprecated. Made obsolete by DFP and later DVI. HDI-45 Apple proprietary. Combines Analog VGA out, stereo analog audio out, analog microphone in, S-video capture in, Apple desktop bus interface. Proprietary connector used on Apple Macintosh Centris computers, and the Apple AudioVision 14 Display. An attempt by Apple to deal with cable clutter, by combining five separate cables from computer to monitor. Female port (20-pin) Digital Flat Panel (DFP) Used with the PanelLink digital video protocol. Deprecated. Made obsolete by DVI. 3D model of a UDI connector Unified Display Interface Proposed to replace both DVI and HDMI. Deprecated by Intel in favor of DisplayPort. 3.5 mm TRRS connector (male) 3.5 mm (​1⁄8 in) TRRS and TRS connector Analog camcorders commonly use a 3.5 mm four-contact TRRS connector to carry composite video and stereo audio. Jack appears identical to more common three-contact stereo audio-only (Walkman) 3.5 mm TRS connector. DisplayPort DisplayPort is also the name of the protocol, which is proposed to replace DVI for computer monitors, and consumer electronics (such as home theater systems). Male Mini DisplayPort plug Mini DisplayPort Proposed alternative to HDMI, used with computer displays: (VGA, DVI) Apple Inc.'s successor to their own Mini-DVI. The same connector is used for Intel's Thunderbolt connector, developed in cooperation with Apple. HDBaseT (8P8C modular connector) Used for transmission of uncompressed high-definition video, audio, Ethernet, high-power over cable and various controls, via a 100 m Cat5e/Cat6 cable with 8P8C modular connectors of the type commonly used for telephone and Ethernet LAN connections. ^ Although YPBPR connections are theoretically capable of higher resolutions, resolutions above 1080p (1920 × 1080 @ 60p) are uncommon. Additionally, many devices limit YPBPR connections to 1080i (1920 × 1080 @ 60i) due to lack of encryption, allowing higher resolutions only via encrypted digital connections. ^ "HDMI". www.hdmi.org. Retrieved 2017-12-21. This page was last edited on 14 March 2019, at 02:20 (UTC).